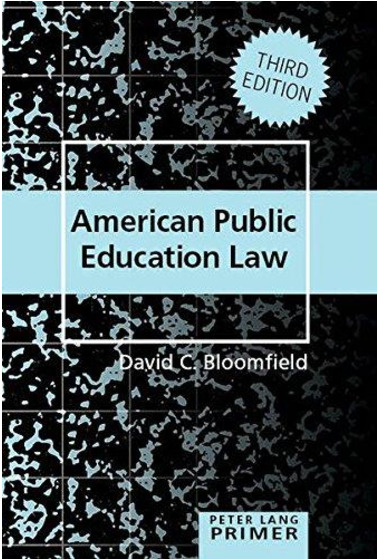 David C. Bloomfield (J.D., Columbia; M.P.A., Princeton) is Professor of Education Leadership, Law & Policy at Brooklyn College and The CUNY Graduate Center. The author of American Public Education Law and other publications, he received the first Paul Robeson Prize in Minority Legal Studies from Columbia Law School and holds certification as a school district superintendent and principal. Prof. Bloomfield is available for expert testimony in education-related proceedings, consulting, public speaking, and press commentary. Bloomfield brings broad professional background to this work. His experience includes public, independent, and religious education; public and private law practice; school district administration; government agency and elected official staff positions; not-for-profit management; and higher education. He served as an elementary and middle school teacher; Law Clerk to Hon. Robert L. Carter (S.D.N.Y. ); Associate in the Education Practice Group at Hogan Lovells in Washington, D.C.; Assistant New York City Corporation Counsel; General Counsel, New York City Board of Education; General Counsel and Senior Education Adviser to the Manhattan Borough President; and Executive Director for public education programs at the Partnership for New York City. His extensive volunteer activities include service on not-for-profit boards and as an elected parent member and President of New York's Citywide Council on High Schools. Professional Development, "Taking Back Your Legal Life"
David C. Bloomfield is a frequent commentator in print, digital, and broadcast media. He has appeared in Education Week, New York Times, Wall Street Journal, Politico, New York Post, WPIX, Fox5NY, WNET, and others. "Thanks again! You are always so thoughtful, and you have an amazingly effective way to express complicated concepts! Working as an education reporter, I am very lucky to be in touch with you and I am very grateful for your kind availability!" Professor Bloomfield consults for public and private agencies, schools, attorneys, and public officials. He also serves as an expert witness in a variety of school law and education-related proceedings. "David served as an expert witness in multiple proceedings for our firm. His combined legal and education expertise proved invaluable. We will consult with him on future cases!"